Denali entrance sign. The mountain basking in the rare sunshine. 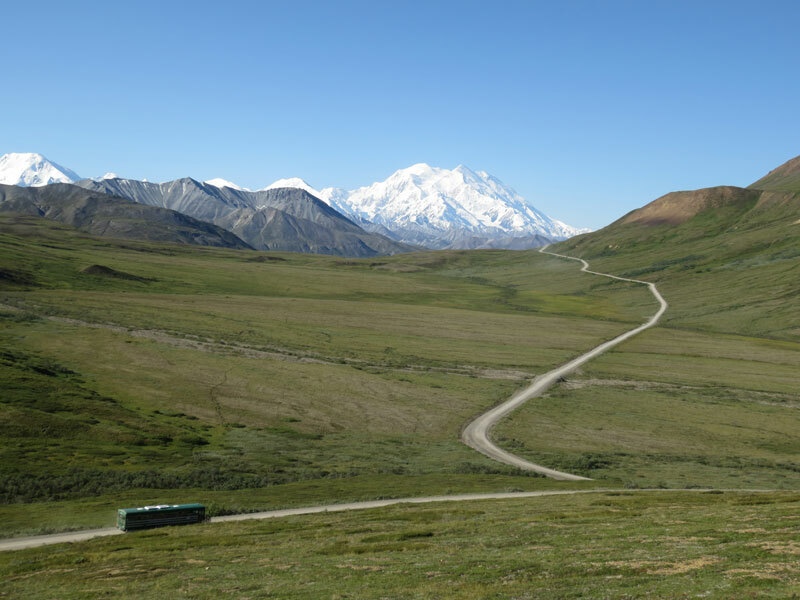 Getting There: Denali National Park is an easy 4.5 hour drive north of Anchorage. Alternatively the Alaska Railroad offers service between the two locations. The literal high point of the trip is 20,237 ft Mt. McKinley, the highest point in North America. Denali translates to “High One” or “Great One” in the native Athabaskan language. The mountain is the centerpiece of Denali National Park, a 6 million acre park and preserve made up of taiga, tundra, rock and glaciers. We approached from the south driving up the George Parks Highway from Anchorage. It was a clear day so even from a couple hundred miles away the mountain stood looming in the distance. What makes it appear even more impressive is the fact that the land around the Alaska Range is only about 2,000 feet above sea level. That gives McKinley the largest base-to-peak height of any mountain entirely above sea level. An 18,000 foot wall of rock and snow is an imposing sight from any angle. There is a phenomenon known locally as the 30% club, because the mountain’s tendency to be completely shrouded in clouds means only a third of visitors every actually see it. In fact, we were told many Alaskans have never seen it up close. By pure luck we arrived when the mountain came out in a cloudless sky three days in a row. A park ranger confirmed that it had not been so clear in 5-6 weeks. The only lodging available within the borders of the park is at six designated campgrounds. We’re more the cabin type, so we chose to stay at the Carlo Creek Lodge about 10 miles south of the park entrance. This was not the most charming cabin we stayed in, but the staff was friendly and the office offered free wifi. There is a nice little cluster of restaurants around it as well. We did our share to support McKinley Creekside Cafe as we purchased breakfast, dinner and two days of sack lunches there. The cinnamon rolls are epic. A shuttle bus making its way toward Eielson Visitor Center. The following morning we booked a shuttle bus into the National Park. Private vehicles are only allowed in as far as 16 miles, only buses are allowed beyond that. The tickets can (and should) be booked in advance through Aramark to ensure you get a seat at the departure time of your choice. Buses leave every half hour from the Wilderness Access Center and you have options for how far into the park you would like to go. We chose the 7:00am bus with a four-hour ride to the Eielson Visitor Center at mile 66. We were lucky and got a shuttle driver named Craig who has backpacked and camped all over the park and shares his extensive knowledge of the animals that live there. He provided a running commentary the entire trip (not all drivers do that) that made the ride extra enjoyable. We saw caribou, brown bears, dall sheep and a wolf from the bus. The park road is the only developed area within the park, and most of it is just a gravel path carved into hillsides. 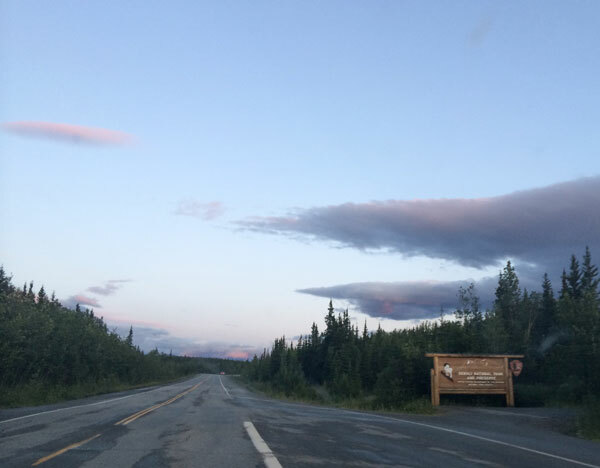 The Eielson Visitor Center is where the majority of people go, but you can opt to extend your bus ride to Wonder Lake or Kantishna 26 miles farther down the road. The center has great displays on the geology and history of the park and a spectacular view of McKinley 30 miles away. Hiking options in Denali are interesting, as there are not many marked trails in the park. There are some easy ones near the entrance, a couple in the Savage River area and a few around the Eielson Visitor Center. For the most part, hiking is of the backcountry variety. If you see a place you want to hike, you simply tell the bus to stop and take off across the tundra on foot. We chose to hike the Eielson Alpine Trail that rises 1,000 feet from the visitor center to a ridge on Mt. Thorofare. It was the best backdrop for a picnic lunch imaginable. The next day we returned to the park for more hiking by taking a free shuttle 16 miles to the Savage River. Because we love to punish our knees, we chose the 4-mile Savage River Alpine Trail that climbs and falls 1,500 feet in elevation and ends at a campground where we were picked up by a return bus. 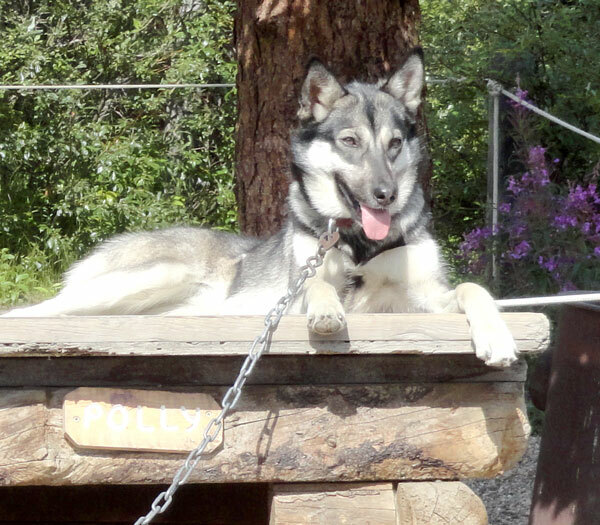 Sled dog Polly chilling on her rooftop. Before we left the park we couldn’t possibly pass up a chance to visit the famous Denali sled dogs. The specially-bred huskies help rangers patrol the park in winter months, carrying people and supplies to the farthest corners of the wilderness to make sure everything is under control. The kennels are located behind the main park headquarters next to a gravel loop where they hold sled dog demonstrations 3 times a day. The real treat is showing up early and getting to greet the dogs before the show starts. They are the friendliest, happiest dogs you’ll ever see and they love meeting their fans. When the rangers ran through the kennels to pick 5 lucky dogs to pull the demonstration sled, they all barked and howled as if saying “pick me, pick me!” Definitely a must-see bit of free entertainment. Fun fact: because of their adaptations to the cold climate, the dogs are most comfortable at -10 degrees fahrenheit. Brrr. A fun personal milestone was reached during our time here, we went farther north than any of us had ever been before. Latitude 66 degrees, 44 minutes north was our extreme point, putting us in line with places like Trondheim, Norway; southern Greenland and Siberia. Denali was also the location of the latest sunset we experienced. 11:05 PM was the magic hour, with twilight lasting until after midnight. It’ll definitely mess with your senses, but is great for maximizing time for activities. The general lack of highways in Alaska meant there there were three route options to reach our next destination, Wrangell/St. Elias National Park. We could backtrack through Anchorage, make a large northern arc through Fairbanks or cut right across the wilderness on the 135-mile gravel Denali Highway. We picked option 3 of course. Before the construction of the Parks Highway connecting Anchorage and Fairbanks in 1971, the Denali Highway was the only road access to Denali National Park. Today it is lightly traveled and only open from mid-May through October each year. Online research warned us of difficult driving and rutted surfaces, but it turned out to be in fine condition for an unpaved road and it cut 2 hours off our travel time. It’s rather isolated out there, but we managed to find a good lunch at the MacLaren River Lodge. As we completed the Denali Highway and turned south onto the Richardson Highway, Mt Drum came into view, beckoning us toward Wrangell/St. Elias National Park. This entry was posted in Destinations, Travel Resources and tagged Alaska Road Trip, Denali Highway, Denali National Park, Denali Shuttle Bus, Dog Sled Demonstration, Eielson Alpine Trail, Eielson Visitor Center, McKinley Creekside Cafe. Bookmark the permalink.